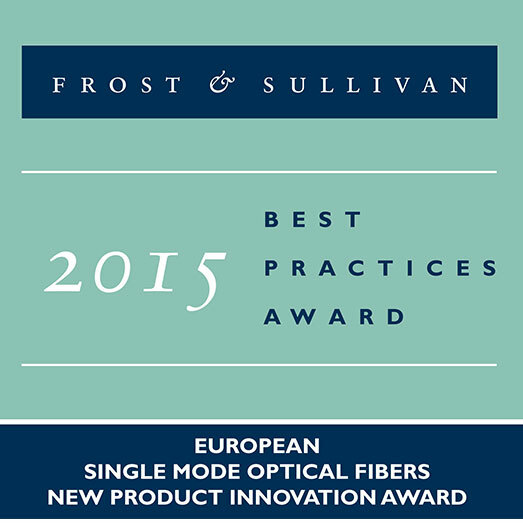 Prysmian Group, world leader in the energy and telecom cable systems industry, is recognised with the Frost & Sullivan 2015 European New Product Innovation Award for its BendBrightXS optical fibre, during a ceremony in London. Each year, Frost & Sullivan, the world leader in growth consulting and the integrated areas of technology research and market research, presents this award to the company that has developed an innovative product by leveraging leading-edge technologies. The award recognises the value-added features and benefits of the product and the increased ROI it offers to customers, which in turn enhances end-customer acquisition and overall market penetration potential. BendBrightXS fibre, initially designed for FTTH deployment, has now opened an innovative stairway for many new cable solutions applicable to a variety of network configurations, combining an unprecedentedly low macro-bending sensitivity (G.657.A2 compliant) and industry reference micro-bending performance while still preserving all the features of regular singlemode fibre (G.652.D compliant). It enables the use of one single consistent fibre type throughout the network, from central office to customer outlets, and represents a significant innovation in singlemode optical fibres, as it secures the full spectrum in a secured and durable way, allowing transmitting much larger amounts of data than competing technologies. BendBrightXS has been the first-ever commercialised bend-immune singlemode optical fibre, with a bend improvement of almost 100 times compared to standard technologies. The advanced bending behaviour has been achieved while preserving the high transmission performance of legacy fibre yet securing all backwards compatibility, by adding macro- and micro-bending performances on top of all key traditional characteristics. Such design enabled to put standard optical fibre to a next performance level, securing transmission even in harsh environments, in every part of the network, triggering cable innovations that were not possible before. BendBrightXS is maximising fibre’s potential and fully secures the spectral abundance naturally offered by fibre, to accompany the current boom in bandwidth demand – and associated requirement for vast frequency spectrum. It is the industry-reference fibre, with its record-breaking performance heavily influencing next-generation networks. This G.657.A2 fibre, thanks to immunity to macro and micro-bending, paved the way for smaller footprint solutions and lower operational costs due to the possibility to achieve unequalled fibre counts with increased density in cables; yet fully securing all transmission bands, including the most demanding L-band and U-band, securing network evolution paths. With production sites worldwide including the biggest plant for optical fibre production in Europe in Douvrin, France, Prysmian has the ability to work with all existing manufacturing processes, including its proprietary plasma vapour deposition technologies that yield leading-edge performing fibre designs that are pushing forward the traditional limitations of cable solution designs, setting the scene for a new generation of resilient optical fibres to create the broadband networks of tomorrow.